Last weekend I had two gorgeous interstate (from QLD) visitors come and stay for a couple of days. Not only that, these two are 'stitchy' friends! Our very first item on our 'to do' list was a visit to a favourite haunt of mine Amitie in Gardenvale. We had a wonderful time with Jen and Lucy and two hours and a nice addition to the stash later we headed on home. There are some Daiwabo fabrics in there, a Lecien and a couple of Moda, a Liberty and yes, on top there is a Bloomsbury Liberty...yes, Amitie now have the gorgeous Bloomsbury Liberty range, get in quick if you want some of these. Next day we made a trip up to Wonga Park to see Linda's fabulous quilt hanging at Quilts in the Barn. 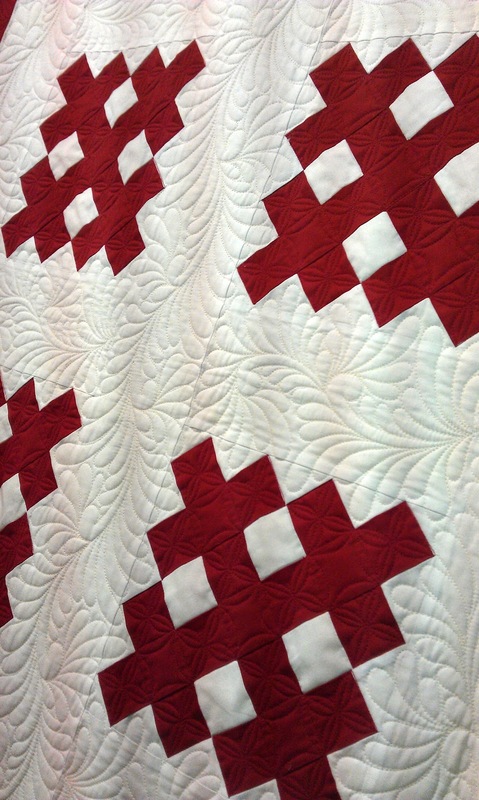 This years theme was red and white quilts and wow, they were awe inspiring! Linda had put together a wonderful display, both new and antique quilts, a few from the 1800's! I apologise for my pics, I took them on my new phone, and often on a side view so I didn't get the people viewing the quilts in the pic too!!! If you pop over to Meredithe's gorgeous blog Pomegranate and Chintz, you can see much better photo's! Oh and Miriam at Yellow Roses blog has even more photo's, wow! Mmm, I showed this old quilt top back in 2009 and I still haven't finished it. 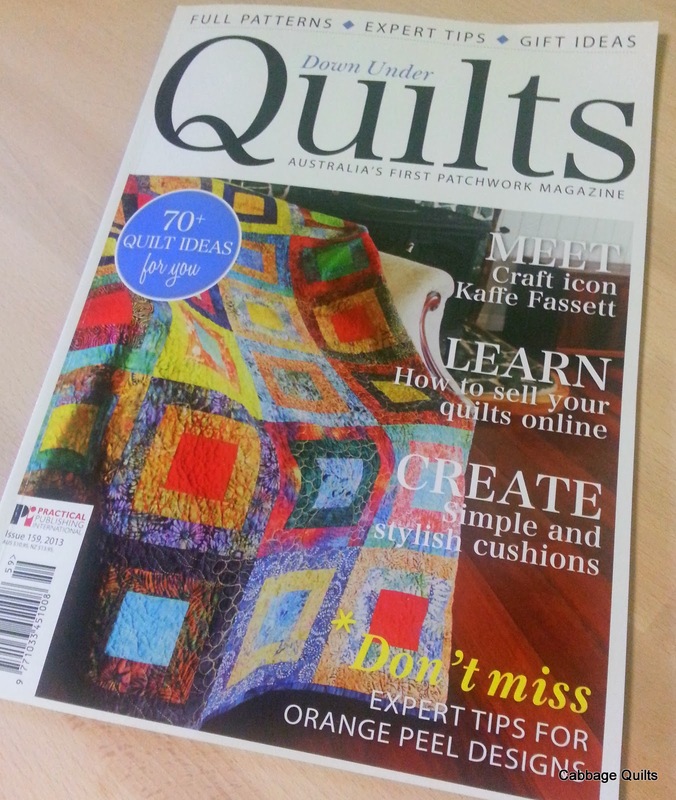 I guess I'm still trying to work out how to quilt it, heehee! Lovely post... My favorite is that double wedding ring... Wonderful!! Nothing like a good PhD (project half done) sitting around! and this one looks perfect.. . .very effective. Once again I am in awe of your needle turn skills. Amitie is my favourite Melb shop. . .lucky for the credit card I live nowhere close . . as your beautiful purchases attest! cant wait to see some "Cabbage" creativity with this lot! Your toile quilt is glorious! You MUST finish it! That's if you can resist that yummy stash of Amitie fabrics! I love the fabrics you got at Amitie, the Liberty Bloomsbury is gorgeous. Yesterday I was looking at the photos Miriam (Yellow Roses) posted of the Quilts in the Barn exhibition and it made me think of your beautiful red and white appliqued quilt waiting patiently to be quilted, I love this one! So glad you've got it out to show us again. 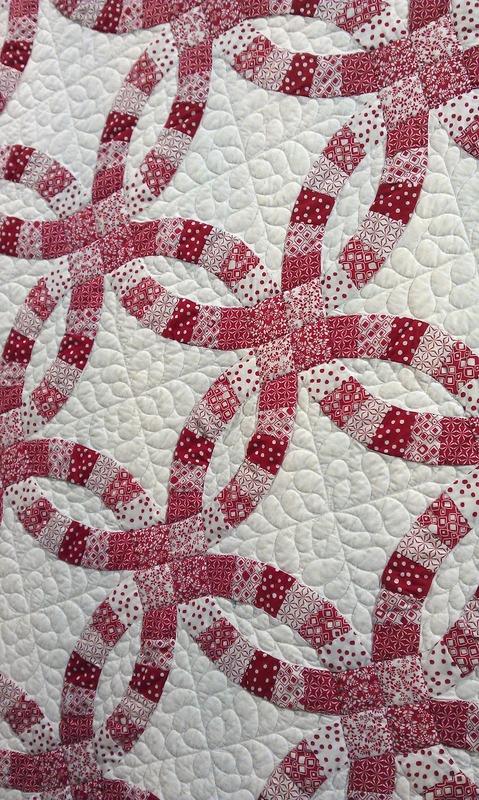 The Red & White exhibition at Quilts in the Barn was so interesting, so many wonderful quilts. 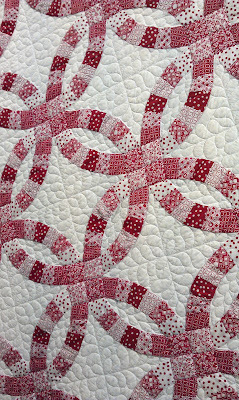 Your 'red & white' quilt top is beautiful, love all those leaves. Beautiful quilt I do hope you quilt it soon and hang it in your home, its worthy of being finished, I just love that quilt. Fabrics are beautiful. a bit of shopping , wow!!!! I was at Quilts in the Barn on Friday - it was a wonderful exhibition! Love your Red & White Quilt - you should finish it. Love your new pile of fabrics! Thank you for the tip about Bloomsbury! There was an amazing array of quilts to see at Linda's this year! I went on Friday morning. Your red and white UFO is beautiful! I love the centre and the print fabric! This show seemed the perfect inspiration for you to finish your own gorgeous red and white quilt. Love the toile. Love the spots on your stack of new fabric!!! Has Amite moved? I thought it was in Bently. I loved the Quilts in the Barn too. A lovely setting for gorgeous quilts. Thank you for sharing such lovely quilts and how glad I am for you to spend time with friends! Ooh, beautiful fabrics and quilts! Yours is gorgeous. So glad you're inspired to finish it. So glad you got to attend Quilts in the Barn. I'm looking forward to Linda posting all the quilts. Will take a look at these links in the meantime. Your toile top is just lovely and absolutely deserves quilting. I know you'll enjoy those new fabrics. Happy stitching! I just love this quilt eye candy! Thank you for sharing! 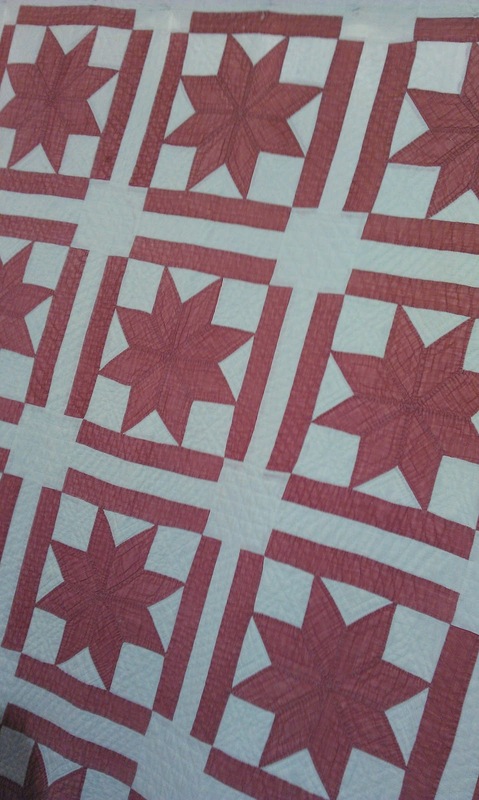 Love your pink and cream quilt, it's just gorgeous. So glad you had a good visit with your friends. It's always fun to have friends with the same interests visiting. And gorgeous new fabrics to top it all off! I love the way you can go out and see some new things and get all fired up again.